We’re more than halfway through the month and the film distributors, having obviously not learned their lesson, continue their winning streak in 2018 by deciding to give a critically acclaimed Nicolas Cage film a limited release. And Hollywood wonders why they’re not making any money. Anyway, because of the distributor’s continued failure to get a grip, I was light on material this week as well. I ended up seeing two acclaimed films, but I’m sorry to say ahead of time that I only thought one was an above-average experience. This story takes place during the Warring States Period in ancient China. Nameless, a prefect from Qin, has arrived at the capital city to meet the king. The latter has survived an assentation attempt on his life by three highly skilled assassins: Sky, Falling Snow, and Broken Sword. Because of this, no visitors are allowed within 100 paces of the king. Nameless claims to have slain all three assassins, presenting each of their weapons to the king. In an unprecedented move, the king allows his guest to come within ten paces of his throne and so he may tell him his story. 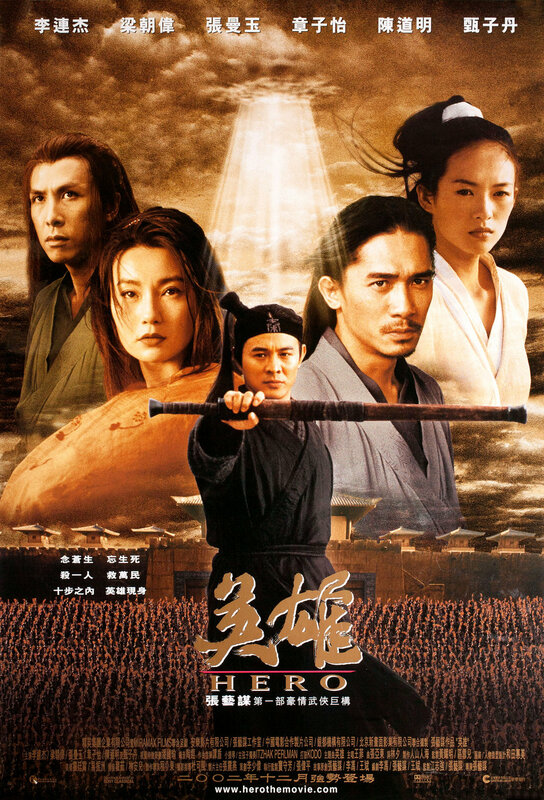 Though it wasn’t really until this year that I began regularly watching international live-action films, this is not the first film of Zhang Yimou’s I have seen. Fourteen years ago, for my Pacific Rim class, we were made to watch To Live over the course of a week. During my school days, I had definitely seen many quality films in my various classes such as A Beautiful Mind and E.T. the Extra-Terrestrial, yet To Live stuck out as quite possibly the best one I had seen. When I became interested in checking out more films from abroad, I eventually decided to see what else Mr. Yimou directed. From there, it didn’t take me long to discover the existence of Hero. Because I like to sample various genres, I decided seeing another highly regarded wuxia film was in order. This film has an interesting story behind it in that it was the most expensive film in Chinese history at the time. Furthermore, Miramax acquired the American distribution rights, yet ended up delaying the release six times. Only in 2004 was it released when Disney executives, the Government of China, and Quentin Tarantino – quite possibly the least likely combination of people imaginable – helped secure an English-subtitled release. Mr. Tarantino even offered to lend his name to promote the film and attract box office attention. For their efforts, Hero became the first Chinese-language film to place number one in the American box office, remaining there for two weeks. The ending is quite controversial, and understandably so. |In the end, Nameless ends up forgoing his chance to kill the king, sharing his sentiment that by unifying China, he would stop any further bloodshed. The king is moved by Nameless’s tale, but to his dismay, has no choice to execute him. The king is then identified as Qin Shi Huang, the first Emperor of China. Depending on one’s interpretation, this could be a rather damning statement on the nature of humanity, believing that lives should be placed in the hands of despotic rulers for the sake of peace. On the other hand, the film also argues that there is an inherent goodness in everyone, depicting Qin Shi Huang as a noble extremist who causes a lot of suffering, but with the intent of causing less in the long term.| I was mostly okay with the final act. Having said that, it does make me a little hesitant to recommend the film, for I can see it completely losing somebody with its potentially unfortunate implications. At the end of the day, Hero was a decent film that, for good and for ill, did not turn out how I expected. Set in 1630s New England, The Witch is the story of a family of Puritans. Willian, who chose to interpret the New Testament in a different fashion, is banished from a plantation with his wife, Katherine, their daughter Thomasin, son Caleb, and fraternal twins Jonas and Mercy. They build a farm by the edge of a secluded forest far from the Puritan settlement. Shortly thereafter, Katherine gives birth to Samuel, their fifth child. One day when Thomasin is playing with the infant, he abruptly disappears. While Willian insists a wolf stole the baby, Katherine is convinced something worse may be afoot. Watching The Witch was something of an experiment I set up for myself. Back in 2015, The Witch was a critical darling, but fans were not impressed, as evidenced by its Amazon rating hovering around 2.9 stars. As of September of 2018, I had not been impressed with many of A24’s releases. I felt they ranged anywhere from flat-out bad (Hereditary) to reasonably well-made, but lacking in personality (Lady Bird and Eighth Grade). In other words, after The Disaster Artist, the talent associated with the company either played things too safely or experimented with disastrous results, which is a decidedly terrible combination. Furthermore, while critics have nothing but praise for A24’s marketing strategies in how they disrupt Hollywood, I myself am not convinced for two reasons. First of all, they’re clearly not competing against Hollywood at the top of their game. Had A24 somehow been around back in Hollywood’s Golden Age, they would’ve been toast. Secondly, it’s not a good long-term strategy. It gets people talking about their films, but at the expense of perpetuating the increasingly antagonistic relationship between fans and critics. I also feel it has the potential to backfire horribly if they’re not careful. Indeed, the only reason they were let off the hook for how they infamously marketed Ex Machina is because it proved to be a hit among fans as well as critics. They weren’t so lucky when they resorted to less-than-forthcoming marketing techniques for The Witch. Granted, misrepresenting your psychological drama as a supernatural horror story isn’t nearly as unscrupulous as stringing random men along on Tinder with a bot, but A24 still continued to put themselves in a bad way for no real reason. However, unlike Hereditary, for which they pulled off a similar strategy, I hadn’t been exposed to any promotional materials for The Witch. I therefore decided to see if I how I felt about A24 was me judging their output on their marketing techniques or as actual films. I think The Witch is, to some degree, the film Hereditary tried and failed to be. Both films go through a lot of the same motions. From a superficial standpoint, they are slowly paced, have few moving parts, and are shot through a very washed out filter. They also do not shy away from heavy subjects |such as the sudden, tragic death of children, potential psychological disorders, and less-than-ideal family situations|. It touches upon them reasonably well, not feeling the need to pull any punches or linger on them for too long. Unlike Hereditary, The Witch is far more ambiguous about how it presents itself. The titular witch even disappears from the plot entirely |after abducting and possibly molesting Caleb|. This leads to many wildly different interpretations of the film’s events. |Does a witch even exist or are all these horrible acts carried out by Thomasin, who went completely insane from the isolation or as the result of some sort of mental disorder?| It’s to the point where some critics believe the ending to be far more uplifting |– quite literally –| than the narrative would appear to have you believe. Unfortunately, I have to say that in a lot of ways, The Witch is the film equivalent of Limbo in that I feel a major cause of these wildly different interpretations stems from not providing enough of a base on which these theories can be formed. In terms of ambiguous storytelling, I feel The Witch has been surpassed by the excellent Leave No Trace. That film provides viewers with a solid enough foundation before placing the onus on them to figure out what drives the characters to do what they do. The Witch, while not to the extent of Hereditary, tends to gleefully break the rules it itself established, leading to a jarring disconnect when asked to figure things out. It’s also a lot like Hereditary in that, paradoxically, its inability to take a stance on certain developments hurts the narrative’s integrity. As such, I am very hesitant when it comes to recommending The Witch. I could see somebody getting a bit more out of it than I did, and it is far from the most disappointing A24 release I’ve seen – not even being their weakest film from that particular year (Ex Machina). At the same time, while I don’t have a problem with a slowly paced film, I feel the payoff wasn’t strong enough, and I also have to admit I didn’t find the characters terribly interesting. It was as though the people behind this film blindly hoped that by presenting things as they were that they would accidently stumble upon a compelling conflict. As it stands, the film takes a long time to go anywhere and in choosing to promote style over substance, it doesn’t allow its well-made aspects to shine. I agree. Hero was a decent film to watch, but nothing more. Like you, I enjoyed To Live as well. I must say, the film is quite depressing though. Another film I really enjoyed by Zhang Yimou is The Road Home. In fact, that’s one of my top favorites. Yeah, it’s another one of those cases where critics loved it, but it never ascends past the level of being merely sort of neat. To Live was way better – I don’t think that film gets enough credit. Haven’t seen The Road Home, though; maybe I should give that one a shot. I am a big fan of Zhang Yimou. I think most of his works are quite poetic. I’ve seen most of his films. Not sure if the Road Home is something you would like though, but do give it a chance. If you enjoy live- action East Asian films, I recommend The Little Dragon Maiden. It is currently on Netflix actually. One thing I like about the film is that it questions society: what is right and what is wrong. Sometimes the good guy is actually the bad guy. It is quite philosophical. It is something I really enjoy. I really wanted to enjoy The Witch because a few folks I’ve come to trust concerning films recommended it and wouldn’t stop talking about it for a while. I appreciated it for what it was due to the performances and a few odds and ends in the plot, but it really felt like that was it. It was a pile of odds and ends piled up to look like a really deep experience. The ending felt apt and underwhelming all at the same time. As much praise as A24 gets, there does seem to be a reoccurring narrative with their art films in that they have glacial pacing for incredibly lame payoffs. I watched the Three Colors trilogy and Dekalog earlier this year, and those art films completely and utterly decimate anything A24 has put out (although to be fair, Moonlight would fare reasonably well against them). Those were art films that didn’t talk down to their audience, and they never sold their stories on the style alone. Modern art films such as The Witch seem to spend three-quarters of their runtime insisting that they’re not like those popular, trashy films you’re an idiot for seeing while forgetting to make a case for themselves and using the arthouse branding to obscure poor writing. It’s like what you’d get if you transplanted Jonathan Blow’s game design ethos to the silver screen. On that note, I’d have to say the independent film scene as of now greatly resembles the independent gaming scene in its first years in how critics were willing to overlooking glaring flaws they wouldn’t have had they been assessing a standard Hollywood/AAA production. The only difference is that while audiences by and large liked games such as Braid and Limbo, they have rejected critical darlings such as Hereditary and The Witch. Granted, there have always been critical darlings that didn’t resonate with audiences, but these rifts tend to be consistently wide. I’m not sure when or if the independent film scene will progress to the reasonably good compromise the independent gaming scene has reached (i.e. dishing out art games that are unapologetic about being games), but it’s evident they have a lot of catching up to do. Either way, I too am glad I’m not the only one who thought this way about The Witch. Like Hereditary, it chooses to place style before substance and is a weak effort for it. It fares a little better than Hereditary for not being as blatantly stupid with its twist, but it’s still a tough sell. Certain essayists out there pen pieces on how audiences are too stupid to appreciate films like this. I say good on the public for taking the high road.